The ‘lone protester’ Kim Jinsuk, as BBC depicts it, is the leader of the Korean Confederation of Trade Union’s Busan district, where Hanjin’s Youngdo shipyard is located. She lives on baked sweet potatoes and porridge on the crane, relying on scarce and precious solar-powered electricity as the only line of communication between her and the world. The company hasattempted several times to block food, water and electricity provided to many laid-off workers who have staged a sit-down demonstration around the crane, and people had to desperately protest the attempts every time. Scorching weather heats up the crane to the extent which one can get burned by simply touching it. Two hundred days have passed. The war got desperate, as Hanjin requested ‘governmental authority’ – that is, support of the police force in blocking the Hope Riders, a mass demonstration in which people around the country come to the 85th crane to show solidarity and support. 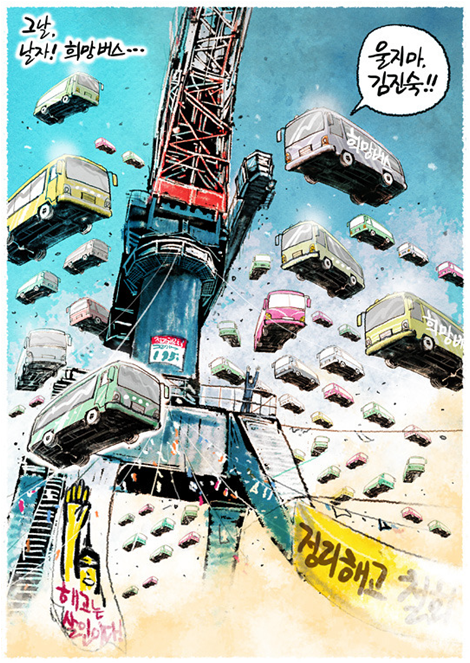 The 2nd Hope Riders already suffered severe suppression, which became a battle by the police force along with Hanjin’s private thugs armed with teargas and water cannon to ‘disperse’ the demonstrators and prevent them from reaching the destination, the 85th crane. The war became desperate, and is getting more desperate, but she is not a ‘lone protester’ anymore. Ten years ago, Hanjin layed off 650 workers and carried out a unilateral wage-freeze, without a single effort to negotiate with its labor union. The company denied the workers’ the right to bargain collectively which is protected by Constitution, and went further to ‘judicial persecution’, as it filed a damage suit against 20 major figures in the labor union, including Kim Jooik, the leader. Consecutively, it put the workers’ wages and houses under provisional seizure, which became a brutal economic persecution against their families. Soon, a bunch of arrest warrants were issued. 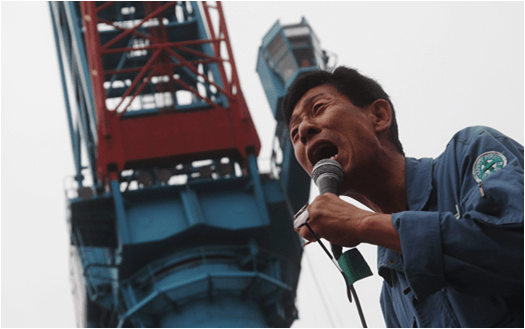 Kim Jooik, calling for the right to bargain collectively and denouncing Hanjin’s violence, went up to the 85th crane and started a protest. 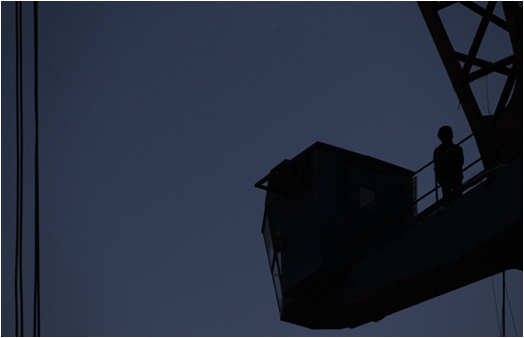 After desperate and hostile battles 115 ft above the ground for 129 days without getting any sign of Hanjin’s serious will on non-violent negotiation with its labor union, he committed suicide on the crane. Ten years later, Hanjin laid off 400 workers and carried out the same wage-freeze, persecution on labor rights. Its official reason for huge-scale layoff was ‘financial difficulties’. But slightly after the layoff, the Hanjin Heavy Industry Holdings, whose holding company is Hanjin, distributed stock dividends equivalent to 16.6 million US$ to its shareholders, which generated public outcry to the corporation’s overt reversal of its own excuse for layoffs, the ‘financial difficulties’. According to the statistics released in a report, during 2007-2010, official records of industrial accidents contain over 5000 cases, and the number of total deaths is more than 41 in Hanjin’s Subic shipyard. Subic shipyard has been notorious for having no single employee that Hanjin directly employs; all workers are hired through web of subcontracts which hide the system’s brutality in the complexity. In such a hiring structure, it becomes extremely easy to evade legal responsibilities of employers to their workers, mainly with regards to working conditions and minimum wage. According to a report that declares South Korea-Philippines joint efforts to deal with the Hanjin’s misconduct in both countries, industrial accidents are recorded as ‘disappearance’ or ‘suspicious death’, to avoid providing proper compensation. 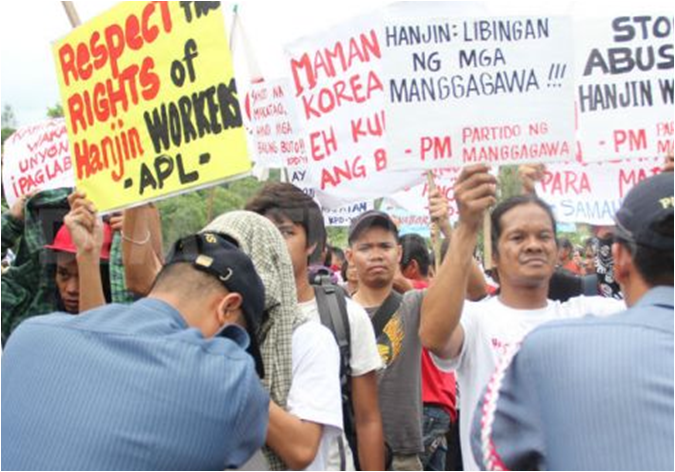 Apart from the subcontracts fully exploiting legal loopholes, it was reported that Hanjin actively prevents any establishment of democratic labor unions by periodic layoff in a six month cycle, because according to the labor law of the Philippines, an employer must hire the worker directly and thus take full responsibility as the worker’s legal employer. Hanjin has always emphasized its ‘legality’ whenever it confronts with demonstrators blaming the corporation’s misconduct and human rights abuse. About 20,000 Philippine laborers work there, and they are forced to stay in the prison-like dormitories inside the shipyard. One worker confessed that he once told his supervisor that he wanted a day off to visit his hometown, which was followed by severe verbal abuse, calling him ‘crazyshit’. The average monthly income of Philippine workers are one tenth of that of South Korea, which is about 300 US$. About 1000 workers are South-Korean, and rest of them are Philippine workers. Most supervisors are South-Korean, who are infamous for their severe racism and wield violence and verbal abuse without any restraint. Trying to organize a democratic labor union is almost impossible, as most of the workers cannot be protected by labor laws due to their temporary positions, in which employers can easily fire any workers who engage in such plans that the corporation loathes. Hanjin reacted to the protest of laid-off workers by hiring private thugs to engage in extrajudicial violence and intimidation against active members of the labor union and laid-off workers who have chosen to fight for reinstatement by peaceful sit-in protest. The thugs also have ‘worked with’ the police force whenever there are demonstrations protesting the firm refusal of the company to talk with its labor unions, including the serial mass demonstration entitled ‘the Hope Riders’. The Hope Riders is a festival-like demonstration in which people around the country gather up to the 85th crane to show support and solidarity. The illustration is by Son Moonsang. Recently, material leaked out to the press, showing prior consultation between the company and the police before the 2nd Hope Riders, which generated shock because of the statements from the police. 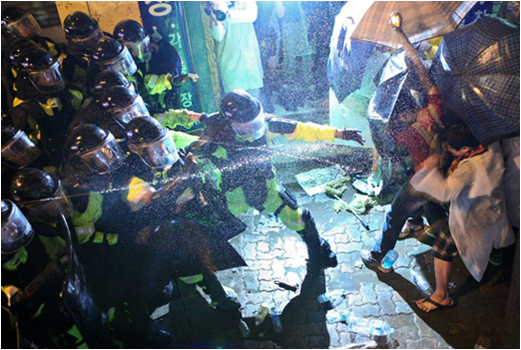 The material directed Hanjin to ‘hire proper people to aid the work of police’ in dispersing demonstrators, flatly indicating private thugs. Furthermore, an arrest warrant was issued to Song Kyeong-dong, one of the most active people in organizing the Hope Riders, due to his role in planning the demonstration. Song is a poet renowned for his works denouncing the bleak reality of South Korea regarding the persecution of labor rights by corporations and governmental power. In a brief interview, he denounced the warrant that “the allegation that the Hope Riders is planned and conducted by several small ‘third party’ groups is just nonsense. People all over South Korea are voluntarily riding down to Busan purely to show their solidarity, in a completely non-violent manner.” The 3rd Hope Riders is planned for July 30th, this year. In a letter announcing the reasons and goals of her starting a heavy fight, Kim wrote that her goal is to “walk down from here by myself, this time alive, which was the desperate wish of the deceased Kim Jooik.” She wrote that she will change the 85th crane from the symbol of desperation to that of the hope, and she firmly believes she can achieve it. It’s not only just Kim’s battle – it’s everyone’s battle who shares the same anger toward the abuse of labor rights in South Korea and extrajudicial violence aimed at the rights protected by the Constitution, through the Law of Assembly and Demonstration. She is not a lone protester anymore. For more images, visit here. This entry was posted in Wikileaks Central and tagged Corruption, democracy, freedom, Government, politics, Protest, Revolution, South Korea. Bookmark the permalink.